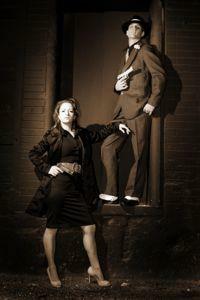 Bonnie and Clyde costumes are a perennial favorite for couples. They are always instantly recognizable and never go out of style. They can be as elaborate or simple as you choose. The celebrity gangster couple of Bonnie Parker and Clyde Barrow were only briefly famous before their notorious shooting death in 1934. They had spent barely two years as outlaws, robbing gas stations, convenience stores and banks. The duo made headlines when their personal photos and poetry were found in an abandoned hideout and printed in the papers. These photos, depicting an attractive young couple in love and on the lam, captured the public imagination. Bonnie, in particular, garnered attention because some of the pictures showed her clowning around with a cigar in her mouth - she was thus labeled a cigar-smoking moll. Even though she never smoked cigars and was not considered to have fired any guns herself, this is the image burnished into legend. The couple have been made more elegant and attractive in the public perception thanks to the classic 1967 film Bonnie and Clyde, starring Warren Beatty and Faye Dunaway. When it comes to making, buying or renting Bonnie and Clyde style costumes, what really counts is the props. You can be any gangster and his moll in 1930s clothes, but if you're both carrying guns, including Bonnie, then there is no question who you are. Accurate 1930s costumes are important. Many people choose to copy the look of the film, which has its own unique style and isn't accurate to the 1930s at all. That said, it's a statement with lots of impact . Real 1930s costumes created a style sensation in their day, with berets, v-neck sweaters and long skirts back in fashion. If you want to be accurate to the real Bonnie and Clyde, look for simple but elegant 1930s outfits. Clyde should be dapper in a three-piece suit with a patterned tie and fedora. Bonnie should wear a skirt that hits at about the calf with a fitted sweater or jacket and sleek hat and shoes. Both should carry pistols - you can carry machine guns, but that can get awkward. Bonnie should definitely have a cigar at the ready. Many of the Bonnie and Clyde costumes available to buy are completely inaccurate to the era. They are fine if you just want a quick and recognizable costume for a couple, but if you want something with a bit more style, you'll have to hit a costume rental or thrift store instead. A quality rental shop is usually going to have the best costumes on offer, as they often cater to local film and theatre productions. Better yet, they can help you with props and accessories - many can even advise on hair and makeup. You can also add details, like having Clyde's tie match one of Bonnie's accessories, further showing them off as a couple. If you want the look of Bonnie and Clyde without the expense of top quality costumes, do some thrift store shopping. Many suits and skirts can be shaped into the right style with a little time and effort, plus some imagination. Be sure that hair and makeup create the part too. If you're feeling especially ghoulish and have a knack with fake blood, you can be Bonnie and Clyde after their ambush. They were each hit with upwards of fifteen bullets, so you can cover your thrift store finds with an array of bloody bullet holes. You can buy fake blood and make it really nasty, or you can just use red fabric paint. Bonnie should wear a light-colored dress for this costume, in order to make it more vivid. Obviously, you want to gauge your crowd, but this is a look guaranteed to be memorable and ghastly.